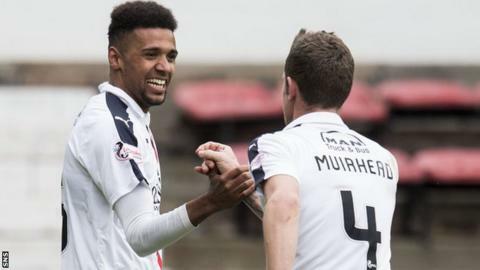 Battling Falkirk kept their grip on second place in the Championship with two second-half goals which sank 10-man Dunfermline. Nicky Clark had gone close for the Pars with a header before he beat Robbie Thomson with a low shot on 35 minutes. Aaron Muirhead levelled from the penalty spot and Falkirk were boosted further when Dunfermline substitute Lewis Martin was sent off for a foul. Nathan Austin came off the bench to head home the winner for the visitors. Clark had looked sharp in the early stages of the match and had forced Thomson to dive full length to his right to clutch a headed effort in 13 minutes. But Thomson was beaten at his far post when Clark struck a shot across goal from 16 yards to give the Pars a half-time lead. However, the match sprang to life after the break. Myles Hippolyte, who had replaced Mark Kerr two minutes earlier, was downed in the box by Pars keeper Sean Murdoch as he stretched for the loose ball. Murdoch was booked for his protests at referee Gavin Duncan's decision and then subbed because of injury, with David Hutton taking over in goal. The home side were reduced to 10 men when Martin, who had been on for only three minutes, was red carded for downing John Baird as he headed towards goal. But it was another substitute who had the final say on the game when, with 20 minutes remaining, Austin found himself free at the far post to head a Craig Sibbald cross over the line. Dunfermline scrapped mightily to haul themselves back into the match but Falkirk, with numerical advantage, always looked capable on the break and held on to take the points. Match ends, Dunfermline Athletic 1, Falkirk 2. Second Half ends, Dunfermline Athletic 1, Falkirk 2. Jason Talbot (Dunfermline Athletic) wins a free kick on the left wing. Corner, Falkirk. Conceded by David Hutton. James Craigen (Falkirk) wins a free kick on the left wing. David Hopkirk (Dunfermline Athletic) is shown the yellow card. David Hopkirk (Dunfermline Athletic) has gone down, but that's a dive. Nathan Austin (Falkirk) wins a free kick in the defensive half. Attempt saved. David Hopkirk (Dunfermline Athletic) right footed shot from outside the box is saved in the bottom right corner. Substitution, Falkirk. Joe McKee replaces Tom Taiwo. Nathaniel Wedderburn (Dunfermline Athletic) wins a free kick in the attacking half. Foul by Nathan Austin (Falkirk). Corner, Falkirk. Conceded by Andrew Geggan. James Craigen (Falkirk) wins a free kick in the defensive half. Lee Ashcroft (Dunfermline Athletic) wins a free kick in the defensive half. Foul by Myles Hippolyte (Falkirk). Attempt missed. Lee Ashcroft (Dunfermline Athletic) header from the centre of the box misses to the right following a corner. Corner, Dunfermline Athletic. Conceded by Peter Grant. Aaron Muirhead (Falkirk) is shown the yellow card for a bad foul. Foul by Aaron Muirhead (Falkirk). Attempt blocked. David Hopkirk (Dunfermline Athletic) right footed shot from the centre of the box is blocked. Corner, Dunfermline Athletic. Conceded by James Craigen. Nathaniel Wedderburn (Dunfermline Athletic) wins a free kick on the right wing. Attempt missed. Andrew Geggan (Dunfermline Athletic) header from the left side of the six yard box is just a bit too high following a set piece situation. Paul McMullan (Dunfermline Athletic) wins a free kick in the defensive half. Goal! Dunfermline Athletic 1, Falkirk 2. Nathan Austin (Falkirk) header from the centre of the box to the bottom right corner. Assisted by Craig Sibbald. Substitution, Falkirk. Nathan Austin replaces Lee Miller. Attempt missed. Craig Sibbald (Falkirk) left footed shot from a difficult angle on the left is too high. Attempt saved. John Baird (Falkirk) left footed shot from the left side of the box is saved in the bottom left corner.